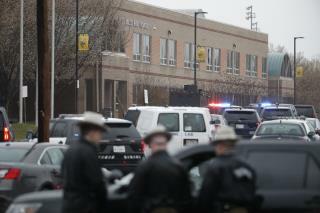 (Newser) – The latest school shooting has left two students wounded and the gunman dead at Great Mills High School in Maryland's St. Mary's County, reports the Baltimore Sun. The shooting happened about 8am, and details are beginning to emerge: Sheriff Tim Cameron says a male student fired at a female student in a hallway, and he apparently struck her and a male student nearby, reports USA Today. A school resource officer arrived on the scene and fired at the shooter, says the sheriff, and "that stopped any further attack or assault." Thank you for your bravery and accuracy. Yipee Kye Aye AAAA you gun controllers! !